Our northern location has made Valtra a reliable and innovative tractor manufacturer. 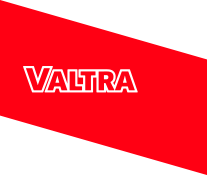 Years of hard work on the fields, farms and forests and innovative R&D have made Valtras robust and agile tractors. We have faced both rain and sunshine, extreme heat and arctic cold at our home base in Finland and beyond around the world. Our experiences don’t just make us reliable – they make us entirely adaptable to the changing face of farming and contracting. Whether it’s dairy or forestry or sugar cane and more, we identify the challenge and develop robust and reliable solutions to meet the need. At Valtra our mission is to develop tractors and provide services that make your daily work easier. Every Valtra is built to full fill the needs of an individual customer at Valtra’s own tractor plant in Suolahti in the heart of Finland. We provide you with the tools and support you demand to operate your business, just the way you want them. The superiority of Valtra tractors lies in the fact that each one is manufactured according to individual customer orders in order to meet specific preferences and requirements. Together with your Valtra dealer you can easily tailor a tractor tailored to your own individual needs and preferences from our extensive à la carte list. Numerous alternatives in terms of transmission options, hydraulics, cabs and other features allow you to specify the perfect tractor for farm work, forestry work or municipal contracting work. You get all the features you need on your tractor without having to pay for anything unnecessary. The power and hydraulics requirements of the implements you intend to use will help you determine the optimal size of your tractor. Valtra offers tractors ranging from 50 to 400 horsepower along with numerous innovative transmission and hydraulics alternatives. All Valtra tractors are powered by reliable AGCO Power engines. With the right transmission, driving a tractor can be not only economical, but also simple and enjoyable. Valtra offers a range of transmission options including HiTech, HiTech 5, Versu, Direct and AVT. By selecting the transmission that suits your needs and preferences, you can be sure that your work will be productive in all possible situations. Valtra offers a range of features that have been designed especially to enhance safety, comfort and productivity. In addition to unique Valtra features, such as TwinTrac or the HiTrol turbine clutch, you can select from numerous cab types, suspension and seat alternatives, additional lights, linkages, hydraulic features, automatic steering, ISOBUS readiness and much more. At Valtra’s Suolahti factory each Valtra tractor is manufactured according to individual customer wishes. The features you select combined with the colour of your choice make your tractor uniquely suited to you and your work. You are also welcome to visit our factory to see your own tractor being built. By listening to customers and understanding what they want, we ensure that the final product is the most efficient and best tractor for the job. We deliver a ready-to-drive tractor that can be put to work straightaway, and which we guarantee is newly manufactured. The company‘s vast level of production allows in-house quality control to be performed on all individual parts. In addition, each end product undergoes thorough testing that lasts between 30 minutes and 3 hours depending on the series. Any deviations that are identified during the manufacturing process are reported to the supervisor, the head of quality control or the technology department, depending on the situation. Major deviations are reported directly to the relevant department and to the supervisors. If required, previously manufactured tractors in the same model series are also inspected for similar deviations. Deviations that require further investigation and more extensive action are also reported to the quality division. Requirements to change a product, a component or a function are passed on to the development division. 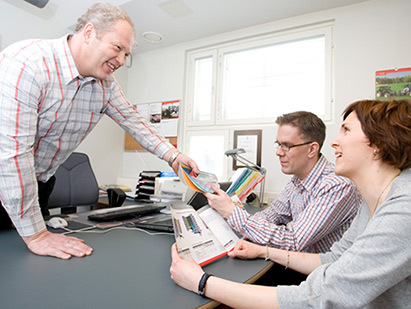 Quality is the leading guideline in the whole organisation, from our sales department to services and parts. Quality is a matter of pride for us. 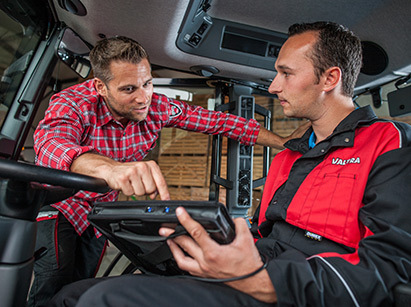 Customers’ experiences are used to build the Valtra tractors of the future. “Customised Valtra” is not just an advertising slogan, it is our philosophy. Our tractors are developed and made for the user. That’s why the R&D department is always collecting feedback and requests from customers. This information is used as the starting point for the development of new models. Because we are part of a global corporation, AGCO, we also have access to vast resources when it comes to product development. 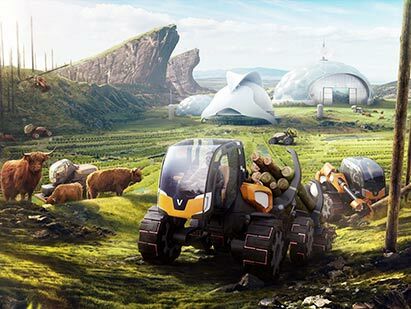 The concept tractor ANTS, which was introduced in connection with Valtra’s 60th anniversary, is a winner of the prestigious red dot design award.